Seoul has modernized so quickly that at times it's easy to forget how ancient the city is. All along the main boulevards of the Jongno district and through the Cheonggyecheon (Stream), Seoul is preparing for a tradition that has been celebrated annually for more than a thousand years...and although Buddha's birthday isn't officially celebrated until May 17th this year, colorful lanterns have been taking over Seoul's streets in anticipation of this ancient tradition. 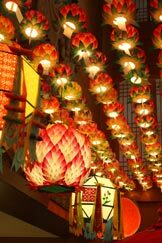 To start, the Lotus Lantern Festival will be kicked-off at Jogyesa and Bongeunsa temples in Seoul from this Friday, May 10, where an exhibition of hand-crafted lanterns made from hanji (traditional Korean paper) will be displayed. The most anticipated event throughout the weekend-long festival will be the parade through downtown Seoul starting this Saturday at 7pm, where more than 100,000 lanterns will be displayed. Get the full schedule and directions to this unique tradition on VisitSeoul.net.